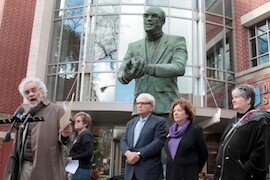 Above: Cherif Bassiouni, center, speaking at a rally at DePaul. We were saddened to hear of the death of M. Cherif Bassiouni on Sept. 25. He was everything the obituaries in newspapers across the country said he was: war crimes jurist, the “godfather of international human rights law,” human rights champion. What U.S. media failed to mention was that Cherif was a tireless and eloquent opponent of the whole legal premise of the “war on terrorism” and its use as a justification of U.S. aggression and crimes of cruel and degrading treatment, torture and indefinite detention without trial. He raised his powerful voice to demand an end to those crimes on the part of the U.S. government, whether under Bush or Obama. Cherif was an advisor to War Criminals Watch and World Can’t Wait whose counsel and support we valued deeply. He titled his 2010 book The Institutionalization of Torture by the Bush Administration. Is Anyone Responsible? 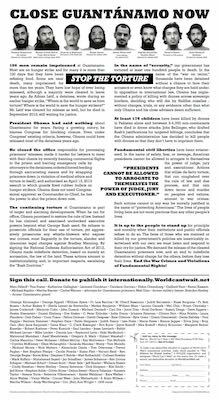 and he dedicated it to "the victims of torture and other forms of cruel, inhuman, and degrading treatment…at the hands of U.S. public agents…” The answer of the Obama administration would prove to be “no," it would not hold any of those U.S. public agents responsible for their well-documented war crimes and crimes against humanity. Cherif, however, held the Obama administration just as accountable as its predecessor. When dozens of prisoners at Guantanamo went on hunger strike in 2013, desperate as it became clear that Obama was not moving to close that torture camp, they forced the horror of their plight back into the spotlight. Cherif was instrumental to the success of our efforts to publish in The New York Times a full-page statement demanding “Stop the Torture! Close Guantanamo NOW!” on May 23, 2013. His letter to colleagues urging them to sign it and donate to its publication remains a powerful indictment of the legal premise and horrific practices of the war of terror. In 2015, he lent his voice to the efforts of students at DePaul, the university where he had taught for 45 years, when they demanded the firing of a dean involved in covering up the role of psychologists in facilitating torture at Guantanamo. His sharp analysis, passion for justice and sense of humor will be missed.